Ideal for use in all weather conditions and for areas of light, medium or heavy traffic, where maximum floor protection is demanded, value for money is expected and longevity is guaranteed. Aluminium grid, both closed and open designs and multiple infill options including colours from rubber ribs to PVC brushes and polypropylene needle punch to coir and nylon carpet - the choice is almost endless. See our stunning new range of easy to fit rubber entrance matting modules for matwells without the need for costly templates, specialist engineers, tools or adhesives. Concourse twin rubber modules for outdoor or part covered entrances where wet weather is a major concern and the use of carpet or other adsorbent material is not ideal. 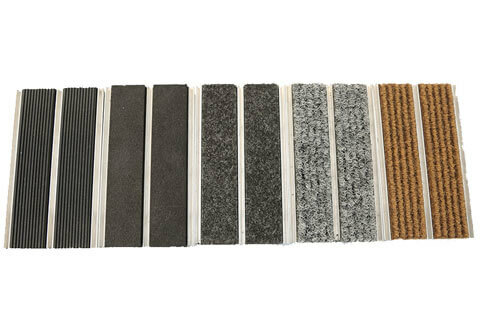 Rubber & nylon carpet insert matrix grid pattern modules for the first barrier against footborne contaminants and moisture offering anti-slip rubber ribs and absorbent 6.6 nylon fabric. New multi directional diamond rubber and nylon carpet entrance matting system module for entrances with multi-directional traffic, ensuring a complete cleaning action whichever direction the traffic flows. All these options are only available from Mats Direct UK Limited, designers and suppliers of UNIQUE entrance matting systems. Matrix rib entrance matting system has interchangeable rubber modules to maximize wear, simply replaceable and at minimal cost thus extending the life cycle of this entrance matting system. 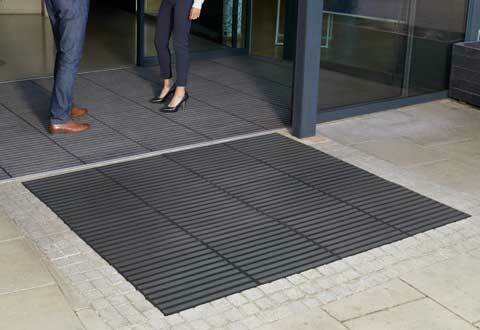 Built to withstand the most demanding of commercial entranceway environments, whilst still maintaining its full cleaning effectiveness, the Matrix entrance matting module with its studded channelling has a high capacity for moisture and debris collection and retention, providing unparalleled grip for added safety in all weather conditions. Matrix matwell entrance door matting modules offers a wide scope for new developments in terms of budget and time constraints, but is also convenient, cost effective and is an ideal replacement for failed metal and plastic entrance matting systems. The integration of our MD9600 Corpromat full colour printed logo floor mat gives the option to place the logo anywhere within the matwell, which is a real bonus and just requires 1 or 2 modules to replace if the branding is changed unlike other systems that may require the whole mat to be replaced. 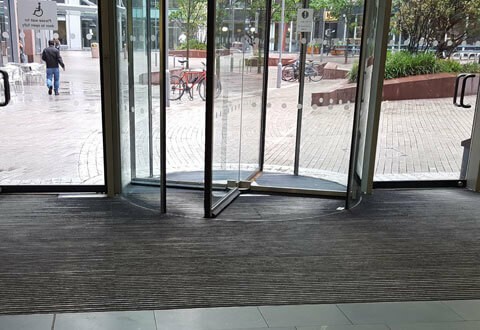 Appreciated by purchasers, designers, specifiers and installers of entrance door mat systems for its simplicity, effectiveness and yet offering value for money, the Matrix entrance matting system is a real winner all round. Why choose the Matrix matwell entrance floor matting system? Matrix entrance door matting is safe. Its rubber base is a user-friendly material, guaranteed to lie perfectly flat to the floor without curling or lifting ensuring a safe, trip and slip-free entrance area. Matrix entrance door matting is quiet - it exhibits excellent sound absorption. Matrix entrance door matting gives a smooth ride, perfect for trolleys and wheeled vehicles without compromising its effectiveness. Matrix entrance door matting is tough on dirt featuring 100% scrape / wipe surface contact across the whole mat. Matrix entrance floor matting is modular and installation is simplicity itself as each module is easy to handle and completely interchangeable without the need for adhesives special tools equipment or skills. Matrix entrance floor matting is ready to lay and can be easily trimmed on and to site requirements, curved or angular with no compromise to its exceptional strength and durability. Matrix entrance floor matting is hygienic. It's highly retentive contact surface is specially designed to capture and conceal soilage where it can be dealt with as part of the routine cleaning programme eliminating the costly and disruptive need to lift out the matting for periodic cleaning. Matrix entrance floor matting is easy to maintain. Standard vacuuming on a daily basis and a deep shampoo clean periodically will ensure its effectiveness and good looks. Stratos rib panel aluminium grid entrance matting is an aluminium rib and infill closed grid panel product. A closed grid construction design avoids the need to constantly lift the matting for cleaning. The panels are available in 400cm lengths for easier installation with less joins. 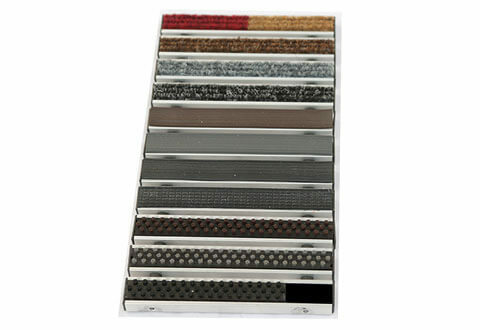 Stratos channel aluminium entrance matting retains more foot borne debris than many other matting systems on the market. With its innovative channel sections it collects dirt below the infill material which results in less debris on the surface which therefore cannot be tracked into the building. The Stratos mat system easily deals with windblown and footborne grit with an efficient deep channel grid to entrap the soilage from where it can be simply removed by vacuum cleaning. The aluminium scraper system comprises a range of popular inserts including, rubber, coir, nylon, carpet or pvc to cover all aspects of indoor and outdoor matting requirements designs and colour schemes. Stratos entrance matting is manufactured in single width panels of up to 4 metres in length, for a seamless appearance and can be supplied to suit any depth of recess frame. Stratos entrance matting can be manufactured to any template shape. Stratos has more than 8 infill types with dense hard wearing fibre to rubber ribs and coir (coconut husks) to polypropylene and nylon carpet to suit any environment. Stratos entrance matting is environmentally friendly being more than 80% recycled material used in the manufacturing process. Stratos entrance matting is hard wearing and perfect for heavy duty environments including wheeled trolleys. Stratos entrance matting is suitable and an ideal alternative for any matwell specification. Concourse heavy duty all weathermatting module is a heavy duty open or outdoor matwell rubber mat module. Specially developed to be used in outdoor matwells which are open to the elements i.e. outside, fully or partially unprotected from the weather. SATRA tested to TM144 for slip resistance. Concourse achieved a HIGH resistance to slip in both wet & dry conditions. Works in perfect harmony with our Matrix MD1000 system to create a zone 1 & 2 entrance matting system area. Manufactured to ISO9002 and conforming to current BS8300 DDA regulations. Most matting systems incorporate a type of carpet or fibre product within the design to absorb moisture and so protect the floor area. When these carpets or fibres get soaked with water, snow, etc. they become ineffective. Concourse door matting has no carpet or fibres so maintaining its full effectiveness in adverse weather conditions. Concourse modules are highly resistant to chewing gum, having no fibre for the gum to stick to, so this unsightly appearance is virtually eliminated. Concourse is a complete rubber mat system and is therefore one of the safest matwell entrance matting systems available. Incorporating two types of rubber profiles, one being flexible, the other being stable allows for the removal of dirt and grit and a certain amount of moisture allowing these contaminants to remain in the base of the module to be removed later during the cleaning regime. Concourse is totally weather resistant and offers unparalleled grip in wet weather, being manufactured to withstand the harshest of environments. Concourse entrance matting system has a rubber base that is a user friendly material. 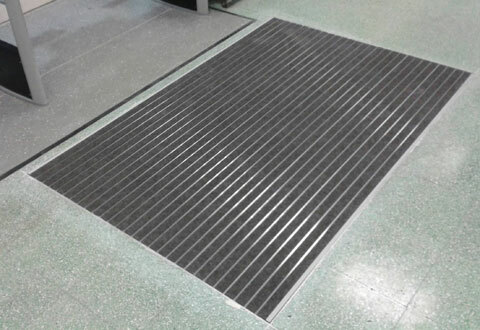 Concourse entrance matting system is guaranteed to lie perfectly flat to the floor ensuring a safe, trip and slip-free entrance area - and its studded and pyramid surface is a boon to the visually impaired at doorways. Concourse entrance matting system features 100% scrape / wipe surface contact across the whole mat. Concourse entrance matting system is the ideal choice for outdoor matwells where floor protection is still required. Concourse entrance matting system where installation is simplicity itself as each module is easy to handle and completely interchangeable without the need for adhesives special tools, equipment or skills. Concourse entrance matting system can be trimmed on and to site requirements, curved or angular with no compromise to its exceptional strength and durability. Concourse entrance matting system is exceptionally easy to fit with no templates required. 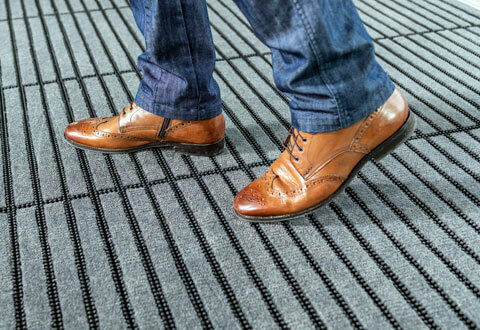 Concourse entrance matting system is exceptionally easy to lay with no specialist equipment required. Concourse entrance matting system is exceptionally easy to maintain for guaranteed effectiveness. Concourse entrance matting system is exceptionally quiet. Thruguard heavy duty open panel aluminium matting has aluminium metal scraper rib open construction and is the perfect choice as a rugged heavy duty recessed door mat product for long term durability. Thruguard open panel mats brings a new vitality to a design concept that has been leading the entrance matting market for over 50 years. Thruguard fall through entrance matting is available with many infill choices to compliment the metal scraper bars - these include nylon carpet, PVC brushes, polypropylene rib carpet and even solid rib rubber. The indoor or outdoor use for the various infills is almost infinite and proves ideal to deal with windblown and footborne moisture by incorporating an efficient channel grid to trap the soilage from where it can be simply lifted out to allow for a vacuum clean. Bespoke sized and can be manufactured to fit any shape of matwell using supplied templates including revolving doors, half moons etc. Ideal as a rugged performing product for long term durability. Brings a new vitality to a design concept that has led the entrance matting market for over half a century. Manufactured from 100% recycled aluminium. Available in 12mm, 18mm and 22mm versions to suit fall though matwells. With a variety of infills can be used for both indoor and outdoor applications. Diamond multi-directional mat module is a high absorbency smooth transition entrance matting - a new approach to multi-directional entranceway protection. SATRA tested to TM144 for slip resistance. Diamond entrance matting achieved a HIGH resistance to slip in both wet & dry conditions. Diamond entrance floor matting has been specially designed for non-conforming door entrances where traffic does not always flow in a straight line. Due to this unique design wherever the traffic flows be it left, right or at any angles to the doorway entrance, they will always achieve 100% contact with the carpet fibres of the mat making Diamond floor matting the only true multi-directional mat system. Interchangeable modules to maximize wear and easily replaceable at minimal cost thus extending the life cycle of the door mat. Because there are no ribs in the design, wheels simply glide over the mat in any direction eliminating the judder of traditional ribbed mats which is particularly important when transporting anything delicate over the entrance area. The unique characteristic of the Diamond entrance matting system is in the deployment of a matrix of diamond studs, carpet pads and round rubber studs as opposed to alternating ribs found in most commercial entrance door mat systems. Ensuring the removal of moisture and grit through its unique interactive cleaning action, incorporating over 256 diamond studs and 3500 round studs in every square metre, creating Active Pile Technology APT® with the nylon fibres. The integration of our MD9600 Corpromat full colour printed logo floor mat system gives the option to place the logo anywhere within the matwell and takes the Diamond matwell mat to a new dimension. Appreciated by purchasers, designers, specifiers and installers of entrance door matting systems that have matwells for its simplicity, effectiveness and yet offering value for money the rubber Diamond multi-directional entrance door matting system is a real winner all round. Diamond entrance floor matting is safe and its rubber base is a user friendly material, guaranteed to lie perfectly flat to the floor ensuring a safe, trip and slip-free entrance area - and its studded surface is a boon to the visually impaired at doorways. Diamond entrance floor matting is quiet and exhibits excellent sound absorption. Diamond entrance door matting is tough on dirt featuring 100% scrape / wipe surface contact across the whole mat in any direction. Diamond entrance door mat's modular installation is simplicity itself as each module is easy to handle and completely interchangeable without the need for adhesives special tools, equipment or skills. Diamond entrance floor matting gives a smooth ride which is perfect for trolleys and wheeled vehicles without compromising its effectiveness. Diamond entrance floor matting is ready to lay and can be trimmed on and to site requirements, curved or angular with no compromise to its exceptional strength and durability. 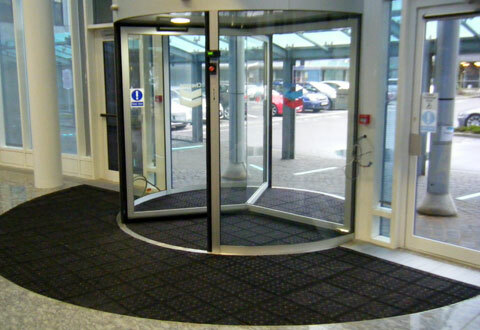 Diamond entrance door matting is hygienic and its highly retentive contact surface is specially designed to capture and conceal soil age where it can be dealt with as part of the routine cleaning programme, eliminating the costly and disruptive need to lift out the matting for periodic cleaning. Diamond entrance floor matting is easy to maintain by standard vacuuming on a daily basis, and a deep shampoo clean periodically will ensure its effectiveness and good looks. Diamond entrance matting modules are a triumph in computer generated, state of the art design and flexibility. Manufactured to ISO9002 and conforming to current BS8300 DDA regulations. Pastaloop coil matting is indoor or outdoor entrance door coil matting rolls and are an ideal scraper entrance floor mat with a fall-through effect for matwell applications or backed for loose laid applications. The open construction of the matting with spaghetti coils of PVC holds a high volume of grit and moisture enabling a clean surface to remain thereby minimise re-tracking. Available in 7 striking colours in both backed and unbacked versions. Especially good in entrance areas where sand is prevalent or fine dust as this falls into the coils and cannot naturally escape. Manufactured to ISO9002, Pastaloop is very cost effective when used as primary barrier matting, completely weather and rot proof for interior or exterior use. The Pastaloop backed version is ideal in surface mounted applications as it traps the debris and moisture so that it does not transfer to the floor area underneath. In this situation the spaghetti coil mats need to be lifted and cleaned on a regular basis to maintain its effectiveness, perfect for use in public entrances, changing rooms, wet areas etc. The Pastaloop unbacked version is used in matwells where the dirt and debris is trapped in the base of the matwell and requires just lifting up to be able to vacuum the debris and dirt from the matwell base. 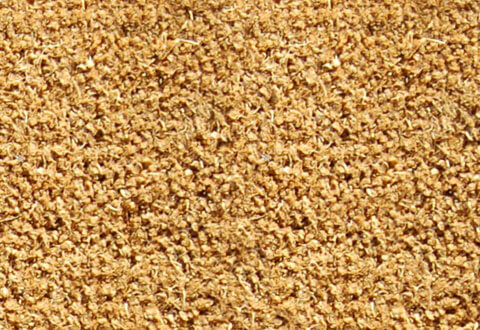 Natural coir (coconut) fibre matting entrance door matting can only be used in the 17mm version in public entranceways. This is to conform to current BS8300 DDA regulations (with approval). Our coir entrance door mats are a hard working 100% natural coir fibre with a PVC backing. 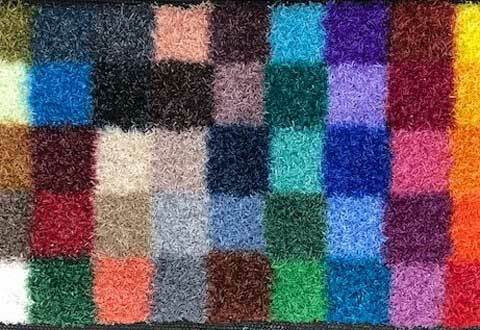 Coir Matting is available in various colours at the 17mm thickness. Can be used in retail, industrial, commercial or public entrances in matwells and is an excellent scraper mat due to the hard wearing coconut fibres. Sometimes referred to as coconut matting this product has been servicing doors and entranceways for many years and is hard wearing. 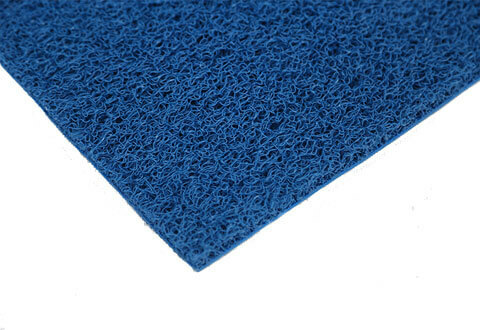 To clean the matting just take the mats out and shake it vigorously to release the dirt. Offering an economical alternative to a full entrance matting system coir (coconut) mats are a cost effective alternative in low to medium traffic areas as a barrier against dirt. How large should my entrance matting system be? According to tests carried out the ideal length should be 6m, however this is not practical in normal commercial buildings so the answer is simply as long as you can make it. The width just needs to cover the area where traffic will flow from the door entrance. How do I measure a matwell? A simple answer is to take measurements of the matwell across the corners from front to back at each side and across left to right again at the top and bottom if in doubt please contact us.